At the end of Part 53, Allin had agreed to help the injured werewolf, Matthias, in exchange for help in escaping the dark underworld of the City. While searching for something for Matthias to use as a crutch, Allin instead found one of the things that live in the dark. The creature was shorter than I had imagined, and its teeth, while sharp and misshapen, were not foot-long daggers. The scariest thing about it was the wooden spear it brandished at me. That and the fact that it had brought friends. A lot of friends. The closest one stabbed its spear at me and I stumbled backwards, falling onto my backside next to Matthias. “What now?” Matthias asked, but he didn’t need me to explain, for the creatures had stealthily ringed us in. A circle of spears convinced me to sit still. “Not what I meant when I asked for a cane,” Matthias said. I could hardly believe he was joking at a time like this. One of the creatures stepped forward and poked at him, barking orders in some incomprehensible language. It held one arm in front of its face, squinting and half looking away while it spoke. When Matthias didn’t react except to bat the spear away, the creature yelled some more. Its companions pointed their weapons at Matthias’ throat while the leader moved in closer, wincing as he approached. “I think they want you to turn off the light,” I said. Matthias swiped his claws and the leader yiped and staggered back. I saw four parallel claw marks etched into its pale skin, and dark red blood began to flow from the wounds. My admonition came too late. The leader clutched at his chest and yelled out in a high-pitched voice. From out of the darkness, a thick-roped net descended over Matthias and me. I guess I was guilty by association. Matthias kicked and clawed at the net, but the creatures reversed their spears and beat him about the head with the blunt ends. The blows hit me, too, so I curled up into a fetal position and protected my head and neck as best I could. They must have wrested his coil away, because even with my eyes squeezed shut, I could tell when its light was extinguished. There followed the most throat-wrenching scream I had ever heard as Matthias transformed back into his human form. His scream continued until it became a rasp that sounded like metal scraping on stone. Finally, it trailed off and I could hear the jabberings of the creatures again. The creatures continued talking, but I didn’t think they were responding to me, and even if they had been, I couldn’t understand them. Now that the light was off, though, the beating had stopped. I opened my eyes, hoping that there would be some kind of light left over after the coil had been switched off. Nothing. A return to the void. Suddenly the net around me pulled taut and I was dragged along with it over the rough ground. It was horrible. I had no control, couldn’t avoid hitting anything, and I never knew when the next impact would arrive. When they stopped dragging us, I felt battered and bruised and all I wished for was to be as unconscious as Matthias. Time passed as it does in the dark, like a drop of water which is poised to fall but never does. I nursed my aches, checked that Matthias was still alive, and waited. Finally, the creatures pulled on the net again and we were lifted up and deposited on some hard surface. A moment later, I felt the sensation of rolling forward. A cart, I presumed. Where to now? That question was still unanswered by the time Matthias groaned awake and I filled him in on what had happened. “I’m surprised they didn’t just kill us,” I said. Merskers? Didn’t sound quite as ominous as the things that live in the dark. I guess I should have been happy that this was one legend that hadn’t lived up to its reputation, but it didn’t change the fact that they were still nasty little creatures who had me at their mercy. And for all his bravado, Matthias was just as helpless, stuck in his human form and injured still. Things were not looking good. After a while, I realized that we were approaching a light source and I wondered if Matthias’ coil had been turned back on. But this light was weaker and tinged with blue. It allowed me to dimly see the cart I was riding in, the now-human Matthias sitting beside me under the net, and the other junk that had been collected along with us. Matthias looked around, frowned, and closed his eyes. “There are ghosts down here?” I asked, pulling on the net so that I could sit up and look over the side of the cart. Sure enough, dotting the garbage-strewn landscape were a number of spectral figures. Our cart was only one in a long train, each one drawn by a pair of merskers. The little creatures were definitely stronger than they looked. As the merskers pulled us along, the ghosts watched us, turning to follow our passage. “I don’t like the way they’re staring,” I said in a low voice. The ghosts we passed began to glide after us on either side of the cart. More and more of them gathered in our wake, brightening the surrounding area considerably. Okay, parts 54-60 are scheduled in WordPress, so I’m good through the beginning of April. And as a reminder, the book is finished (90 parts total), so you will get to read the complete story, one way or another. I just need to load all the pieces into WordPress, which takes time, so I only schedule a few posts at a time. I locked eyes with Matthias. I didn’t let go of his necklace and he didn’t let go of my wrist. I held on for another few seconds out of sheer stubbornness, then gave up and sat down a few feet away. It wasn’t worth fighting over. He could have the damnable coil; I was happy just to be able to see again. Copper was right! And I felt certain I was right about Dad’s passphrase, too, much good it did me now. Matthias lifted his head to inspect his leg. He’d get no sympathy from me. I had more important concerns. “Why should I help you?” I asked. I considered refusing. The reasons to not help him were varied and compelling. But I was tired, cold, wet, hungry, and lost. He couldn’t make my existence any worse than it already was, and he might be able to help me out of this dismal garbage heap. Matthias lifted the coil off of his chest as far as his necklace would allow and held it there, his hand shaking. When I saw the open wound I turned my head away and clamped a hand over my mouth. You can do this, you can do this, I told myself over and over. I steeled myself for the task, breathing quickly through my nose. Slowly, carefully, I placed one hand above the tear in his thigh and grabbed his ankle with the other. “Do it already,” Matthias said with a snarl. Fine. I pulled his ankle and lifted it up, while holding pressure on his thigh. The bone slid back into his leg with a gut-twisting squorch, and while Matthias howled and screamed enough to wake the dead, I turned and retched up whatever was in my stomach. When I finished, Matthias had quieted down, having passed out. His chest rose and fell in huge, bellows-like gusts and he twitched and grasped at invisible foes in his sleep, his claws raking the ground around him. I considered trying to steal the coil again, but decided it was pointless. We would work together for now, but once an exit was in sight I would need to find a way to slip his grasp before I ended up his captive once more. After maybe half an hour of fitful sleep, Matthias came to with a gasp. His first words surprised me. “I don’t want to talk about it,” I said, thinking of the jammed gun. It was too embarrassing to mention. I doubted that, but having nothing better to do I stood up and looked around. My mood was dark despite the moonlight provided by Matthias’ coil. Here I was, deep in the bowels of the Earth, grubbing through piles of garbage on an errand for a werewolf. If there were a polar opposite to what I wanted out of life, this would be it. I kicked through piles of garbage until I saw a length of metal on top of one mound. It might work. I clambered up the trash pile, reached out my hand to grab the bar, and froze. A pale, humanoid creature with huge, round eyes stared back at me from the other side of the mound. It bared its teeth to reveal twin rows of jagged spikes. My heart hammered in my chest. It was one of the things that live in the dark. Part 53 is most of a day late to post. That will teach me to forget to schedule the page before going away for the weekend! Well, I’m exhausted from a first hotel stay with toddlers, so I’ll keep this brief. Progress continues on the cover for Book 1 of The Only City Left, and outlining continues for Book 2. See you next week! At the end of Part 51, Allin woke up alone in the darkness after falling into the abyss and his own memories. Where is he now and how did he survive? Wherever I was and however I had gotten there, I took solace in the knowledge that I had escaped the clinkers. I only hoped Tumble had been able to get away from them, too. At least that part of my plan had seemed to work. The part with the grapple gun: not so much. I began to laugh as I realized what must have happened. The nutrient jelly, loose in my backpack, had gotten into the gun and gunked it up, preventing it from firing. Thanks again, Tumble. I continued to laugh in the darkness, a cackle tinged with hysteria, verging on sobs. Suddenly, the thought of what else might be in the darkness clamped my throat shut. My laughter turned into a choking fit, and when I got that under control, I held very still and listened carefully for anything that might be sneaking up on me. Besides my breathing I heard nothing, not even the sound of water falling that I would have expected if I were at the bottom of the abyss. Complete silence. If something were ready to pounce, it wasn’t betraying its presence in the slightest. Maybe the things that live in the dark don’t make sounds. Maybe you don’t know they’re there until you feel their long, cold teeth separating your head from your neck in one go. Maybe, maybe, maybe. Maybe if I didn’t stop thinking such thoughts, I would scare myself to death before anything else had a chance to kill me. I took a deep breath of salty, slightly rotten air, choked back a gag, and resolved to get up and quit being frightened. Since the ground beneath me was unstable, I crawled rather than walked through a silty, slimy concoction that I was glad I couldn’t see. To protect myself as best I could, I moved slowly and kept my head down. Despite my best efforts, I soon had innumerable tiny cuts stinging my arms and legs. I whimpered as I moved, a primal sputtering born of pain and panic and the belief that I would soon be dead in this dark, hellish underworld. There was a pleasant thought: maybe I was dead already and this was my personal hell. No, my hell would involve crawling through ducts for all eternity. This was just damned scary. I pushed on despite the bile rising in my throat and the imagined creatures about to lunge at me. Left hand, left knee. Right hand, right knee. Repeat. I thought of my parents, who had fought so hard to keep me alive, who had given their lives for mine. Always stay alive. Dad’s favorite bit of advice for me. His last words to me, in fact. You’re a light in the dark. Mom’s wisdom. I used their words to keep me moving. Always stay alive. Left hand. You’re a light in the dark. Left knee. Always stay alive. Right hand. You’re a light in the dark. Right knee. One after the other after the other as I crawled over and through and between who knows what, headed who knows where. To their wisdom I added my own. Never stop moving. Since Mom and Dad had died, that more than anything else had been my motto. Mottos. Words of wisdom. Something about Mom and Dad’s advice suddenly struck me as having a deeper meaning than that. I stopped in my tracks and hovered there in the darkness as my mind raced through memories to test this insight. Mom’s oft-repeated refrain: “You’re a light in the dark.” That was the last thing she said when she left me in the locker. And then there was a flash of white light. “Always stay alive.” Dad’s last words to me. One final bit of fatherly advice? Or, as he wrapped my hand around his lantern coil, was he was giving me the passphrase to unlock it. And maybe “You’re a light in the dark” was Mom’s passphrase! If I was right, I had had the key to unlock Dad’s lantern coil the whole time, without ever realizing it. Poor Professor Copper. I hoped she wasn’t banging her head against the wall too much trying to figure it out. I doubted that she would happen across the proper passphrase by chance. I was distracted from this train of thought when I noticed a hint of illumination to my right. It wasn’t a distinct light so much as a less-inky black, but since I had no better destination, I turned toward it and continued my trek through the sludge. It might have been minutes or hours by the time the world began to slowly reveal itself. I crawled over broken machines, dead fish, and jagged chunks of concrete with steel rods dangling from them like giant eyelashes. There were lengths of twisted metal and viny tangles of sodden foliage, pools of multi-colored slime and chunks of decayed dreck that I couldn’t begin to identify. I had ended up in a junkyard. There was enough light now that I could stand up, trembling from cold and exhaustion, and take my final steps toward the white light. I wasn’t too surprised when I shambled over a pile of rubble and saw a werewolf on the ground, the white light emanating from his coil. His left leg was bent at an improbable angle, a jagged white bone sticking out of his thigh. I recognized Matthias. He looked dead. Serves him right, I thought, and knelt down to remove the coil from around his neck. As I grabbed the necklace, his hand shot out and gripped my wrist. “I think not,” he growled. 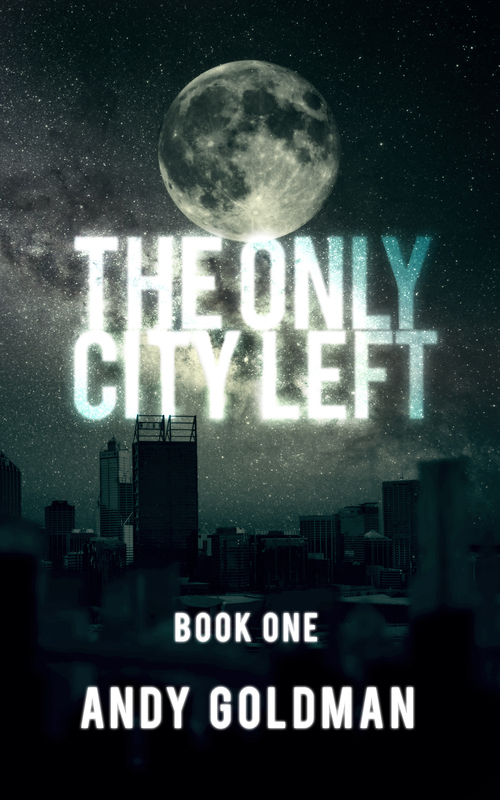 I have secured a cover artist for the eBook and Print-on-Demand versions of The Only City Left. He should be getting back to me with some thumbnails this week and I can’t wait to see them. I will be seeking the input of one or two beta readers in the meantime. If you’re a long-time reader and would like to read all of The Only City Left in one go and provide me with some constructive feedback, let me know in the comments. I would be looking for readers who have enough time in their schedule that they could get notes back to me within one month (mid-March). At the end of Part 50, Allin’s mom ordered him to hide in a locker while she confronted two tough-looking punks. No response. Only the sounds of a scuffle, flesh hitting flesh, screams. I yelled and fought against the constraints of the locker. Something was happening out there. Mom needed me, and I was trapped, helpless. More sounds. Whumps and thumps and slithers and screams. Without a clue as to what was going on, my mind provided the worst imaginable visuals, and tears began to pour down my face. “Almost done, Allin,” came Mom’s voice from outside the locker. She sounded different, like she had been hurt maybe, but before I could question her, she was gone again. I heard more of the same sounds, further away. I threw myself against the locker door repeatedly with what little room I had to work with. Forget Mom’s orders, I couldn’t stand to be locked up for another second while she was getting hurt out there. The door seemed to be giving way a fraction more each time I hit it, until finally it flew open on its own and I fell into Mom’s outstretched arms, crying. I sniffed back my tears and pulled away. I looked around and saw that the relatively clean path was now strewn with garbage from the surrounding areas. It was not strewn so evenly, however, that I could not see streaks and pools of blood beneath it. I looked at Mom and saw that she wasn’t injured, so she must have really done a number on those guys before they took off. She led me deeper into the locker room and around a corner into a room full of toilet stalls and showers. Dad rested on the grimy, tiled floor below one of the shower heads, shirtless, bleeding from cuts on his face and chest, his wrists bound with rope. He gave me a crooked smile as I knelt down to grip him in a fierce hug. Mom cut his bonds with her knife and then walked over to a nearby folding table that was covered with various nasty-looking instruments. She picked up Dad’s lantern coil from amongst those and handed it back to him. “Pretty much. Dig that ad,” he said, nodding at the table. Mom picked up a piece of paper, examined it and then crumpled it up and threw it into a waiting toilet bowl. Mom and Dad made eye contact and Dad looked down at me with a wry smile. With that, Dad left. I turned away from Mom and looked around. More blood on the floor in here. True to her word, Dad returned shortly and announced the way was clear. We left the factory behind and neither of my parents ever again spoke of that day, the day I had gotten a glimpse behind their veil of secrecy. Nor did Mom repeat that particular fairy tale, perhaps for fear it would dredge up forbidden memories. I wouldn’t see that side of my parents’ lives again for years, by which time I had forgotten the factory incident. When this dream or memory or end-of-life vision ended, I was no longer falling, but I couldn’t tell if I was asleep or awake, alive or dead. I was fairly certain my eyes were wide open, but I couldn’t see anything. Rationally, I knew I should be dead, but my body told me otherwise. I could feel that I lay on a bed of objects, some painfully hard and others disgustingly soft, and that my legs were submerged in some clinging, viscous goo. There was a sick-sweet odor of rot and salt in the thick, moist air and I could hear myself moving and breathing, but beyond that I existed in a void that led me to believe I was either blind or in complete and utter darkness. Thinking to test which one it was, I felt for my wristlight, only to be rewarded with a sliced finger. The wristlight was cracked open, its algae long gone. The pain of the cut told me I was alive, at least, but I was clueless as to how I had survived. All I knew for sure was that I was cold and alone in the darkness, and despite what my mother would have had me believe, there was no light to be found. And so the flashback comes to an end. In the present (mine, not Allin’s), I am reading through the completed book for a third time, and still catching errors. This may be my last read-through before I offer it up to some beta readers. I’m looking forward to being done with editing and started with writing Book 2!